Interesting. I really liked Spells better than Wings. I am so sick of the human boy getting the shaft in paranormal romances. 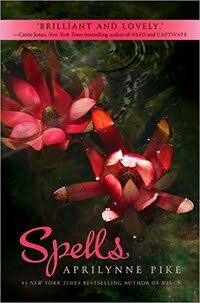 I also think that this book was much better written than Spells. This is why I love reviewing…we all have our own viewpoints and different book resonate with each of us. David really is a great human I just have a soft spot for nice fairies. I DO think it is interesting! Thanks for commenting 🙂 Your blog rocks. I fully agree with you regarding Team Tamani, and I am so ready for David and Chelsea to get together. 🙂 I actually liked the class structure issues in the faerie realm & hope to see that explored a bit more in the third book. It reminds me a little of Hermione’s house elf crusade in the Harry Potter books. I liked the scene between Shar and Laurel near the end of the book, it may have been a little harsh but she needed to acknowledge what she’s been putting Tamani through. I am curious to see what mysterious mission Tamani is about to take on, any guesses?